The objective of CRAM is to initiate a national discussion on academic materials between all stakeholders within our institutions with the purpose to understand and develop a holistic and comprehensive institutional approach for the long-term sustainability of academic materials. Recent market forces and policy changes in the landscape of higher education publishing has accelerated the disruption of traditional business models for third party course content in a complex and rapidly changing environment. The shift from print to digital learning materials is causing all stakeholders involved in course content creation, ownership, distribution, delivery, support and consumption to evaluate their role in this changing landscape. The broader academic materials market including published research has reached unsustainable levels marked by prohibitive journal subscription costs and an oligopoly state1 . As stakeholders seek to redefine their roles in an increasingly disruptive academic materials market, it is critical, more so now than ever, that Canadian institutionally owned campus stores position their operations for long term sustainably as part of a holistic and comprehensive institutional approach. Founded in 2007 at the University of Alberta as a partnership between the Bookstore and Student’s Union, the Canadian Roundtable on Academic Materials was created as a collaborative effort to primarily address the high cost of course material and was built on 9 key principles with the goal “to ensure the existence of an ongoing medium through which the key parties can identify and implement ways of addressing the underlying issues”. Reflecting on the changes of nearly a decade since CRAM was inaugurated; Campus Stores Canada brought together institutional stakeholders in a forum to identify current issues, trends and opportunities to position as a collective voice for the institutions we serve. CRAM 2017 resulted in elements of a 2025 vision being developed. Click here to read the CRAM 2017 Report. 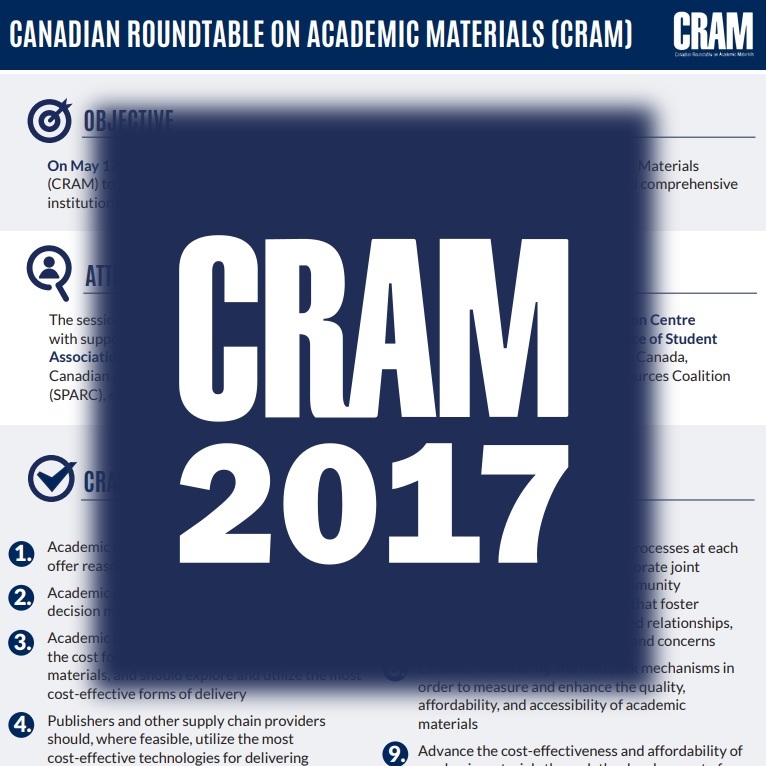 Building on the success of CRAM 2017 and with a clear vision for 2025 developed, CRAM 2018 was held on October 23rd in Ottawa to have a more focused discussion on two of the CRAM Principles. CRAM 2018 focused on Principle 7 & 8. Click here to read the CRAM 2018 Report. Academic materials must be a high quality and offer reasonable value to students. Academic Community Members are the ultimate decision makers for selecting academic materials. Academic Community Members should consider the cost for students when selecting course materials, and should explore and utilize the most cost-effective forms of delivery. Publishers and other supply chain providers should, where feasible, utilize the most cost-effective technologies for delivering academic materials. Strive for a clear balance in copyright legislation between owner and user rights that promotes the sharing of ideas. Encourage academic community members to fully and clearly understand the legal implications of copyright-related agreements, so that Fair Dealing can be fully exercised at the campus level. The academic materials delivery processes at each participating school should incorporate joint Bookstore, Student, Academic Community Members and Library committees that foster communication, promote enhanced relationships, and facilitate the sharing of ideas and concerns. Establish monitoring and feedback mechanisms in order to measure and enhance the quality, affordability, and accessibility of academic materials. a. Advocacy strategies and tools that can be utilized at the campus level to promote enhanced awareness of the problems and the solutions. b. Advocacy strategies and plans at the national level that focus on presenting a concerted and unified position in relation to matters concerning academic materials. c. Communication with other national entities in the sphere of post-secondary education, including but not limited to the Association of Universities & Colleges of Canada (AUCC), the Canadian Association of University Teachers (CAUT), the Canadian Association of Research Libraries (CARL) and Campus Stores Canada (CSC). Apot an adaptive, flexible, and rigorous approach to course materials. Build critical relationships with faculty to ensure resource decisions are made with a complete understanding of available options. Ensure all stakeholders within institutions are working together to deliver the best value to the student. Promote an insitutional vision and strategy for Course Material. A comprehensive report on the 2018 meetings intended to capture the conclusions and postulations of the 2018 conference. See the report given to all members of CRAM 2017. The original outlining documents that posted our current strategies. 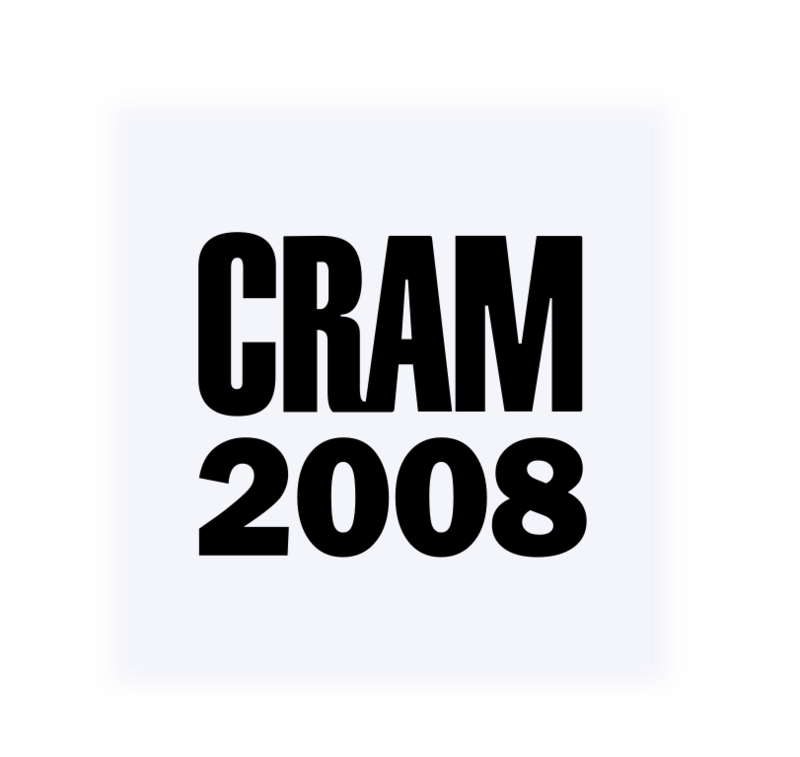 Engage with the original CRAM Key Principles drafted in 2007-2008. CRAM was designed to be a conversation between all stakeholders within our institutions to provide shared input for equal benefit. Campus Stores Canada (CSC) re-initiated the conversation in 2017 and 2018 and would like to see this built into a broader national discussion. In 2019-2020, CSC will be hosting CRAM sessions in Vancouver, Calgary, Toronto and Halifax. Dates for these sessions will be announced in June 2019.